OMR Software is provided as Lifetime License on one-time payment. Answer Sheet Checker OMR Software or OMR Sheet Check Software is widely used by educational institutions for conducting objective exam based on MCQ Test pattern, in order to get quick & accurate test results. OMR Form Reader is a handy software that can be used for collecting data for marketing, and for administering admission processes and to collect and store candidate information. Facilitates automated data processing of Multi Choice Questionnaire (MCQ) forms. Reads candidates responses on the OMR Answer Sheet or OMR Form and converts them into electronic data. Allows for statistical analysis of the responses and further processing of information into OMR results, which can be exported into Excel sheets. OMR Answer Sheet Check Software is a fast and efficient way of checking and marking objective examinations. OMR Software reads OMR Sheets and produces detailed reports, which allow for in-depth analysis of individual students, groups of students, questions and topics. OMR Solution considerably saves time, but it is the reporting facility that often proves to be of most interest as it allows for an analysis of student understanding of items of knowledge and has implications for potential improvements in teaching and learning. OMR Form reader is capable of reading OMR Application Form no. using Optical Character Reading (OCR) technology. OMR Form reader also captures candidate photo and signature images in OMR Answer Sheet and OMR Forms. Unlike other OMR Solutions where it is essential to maintain straight scanning of OMR Sheet but in case of the Addmen OMR Software automatically rotates and corrects tilted OMR sheets to deliver accurate results. The accuracy of the results is not affected by thickness of the paper or color of OMR Sheet printing. The accuracy is also unaffected by the number of OMR sheets to be read. The OMR Software has intelligent OMR Scanning defect detection mechanism which automatically adjusts OMR Reader parameter in case of different modes of OMR scanning in the same lot of OMR Sheets. Thus minimizing the case of rejection to almost zero. OMR Sheet Reader runs well on any computer running onWindows XP, Vista, 7/8. You don’t need Internet connection to scan the sheets using the OMR Software. The speed of OMR form reading is unaffected by the number of OMR sheets to be read. So OMR Software's are much cheaper as compared to Hardware OMR Scanners Machines. OMR Reader is a complete replacement alternative to costly OMR Scanners Technology. A ready-to-use Online Result module is available on lease which can be linked to your website. 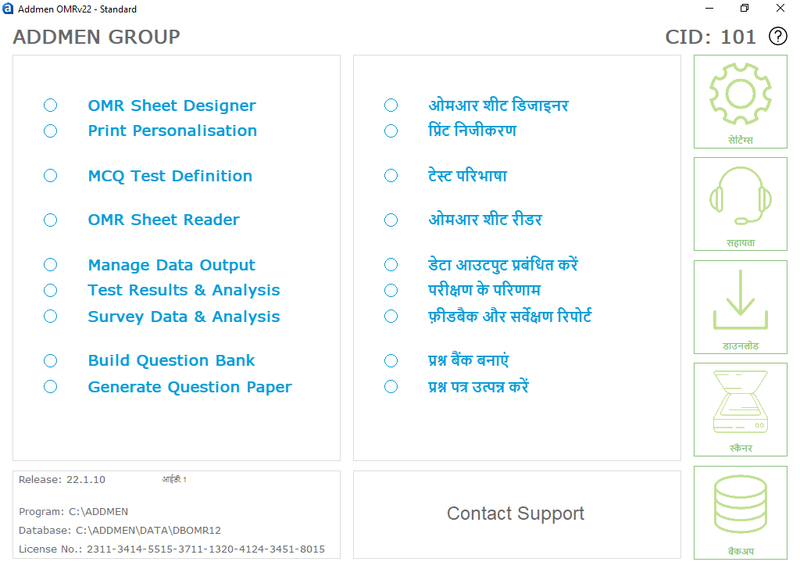 The students can login and see their Online Result with OMR Sheet, Graphical Analysis & Solution. Calculate OMR Result, view marklists, statistics, detailed graphical analysis & detailed OMR sheet data in pre-designed result layouts or export to Access, Excel, Dbase or XML. "Re-Evaluate Data" function allow us to quickly and easily change Basic Answer Key after evaluation without re scanning sheets. Selectable display parameters choice like Percentage / Percentile / Test Rank / Class Rank etc. Reports are exported in PDF/EXCEL/words/RTFetc. What is a OMR Software ?